The program welcomed six new students and three of them had interrupted their studies for lack of resources. Since they do not have a long history with the program, in exchange, they will actively work with the children. Minoska Rios needs one more year to become a certified teacher. She will graduate in December 2018. Julieth Garcia will start the third semester at the Normal Teacher’s School and will graduate the first semester of 2019. Aldair Camargo will start his seventh semester of Civil Engineering at the University of Magdalena. Juan Camilo Mejia will start the first semester in computer systems at U. of Magdalena and Sandy Patricia Almeida del Toro will work on her thesis in Journalism and should graduate in September 2018. She will work with Fundehumac’s Virtual Radio Station in programming. Patricia Gil Mojica, the first Wiwa indigenous girl has registered to become a Spanish teacher from the University of Magdalena. She will become an important asset to her community because Wiwa women do not have a good command of the Spanish language. Patricia is the thirteenth student in the program and she is currently an Assistant Teacher at her Encanto School in the Sierra Nevada. Some graduated professionals shared their views about their experiences with MFI. Thirty eight back packs were distributed to the children in the Paso a Paso program and thirteen MFI scholars signed receipt of their scholarships. Girls from Paso a Paso performed as musicians (the first ever recorded only girls’ percussion group). Two girl vocalists accompanied the musicians. 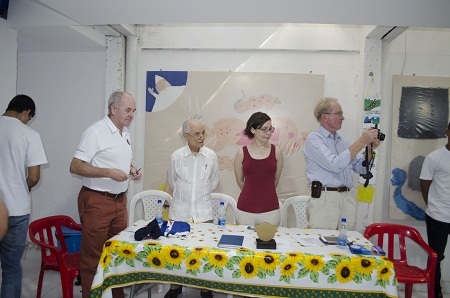 Eight students from San Juan de Tocagua in Atlantico, who are sponsored by a single donor, also performed and their sponsor was present at this ceremony. The program in San Juan will be modeled after the MFI model in Santa Marta. After the attendees were given a short tour of the museum, the ceremony came to an end.